54W – 1047mm/42”(l) – 5/8”- 16 mm (w) AQUA BLUE 50:50 tube combines the phosphors of a Blue Plus tube with a 10000k full-spectrum daylight. Great as a standalone bulb. Rio 240, Rio 300, Vision 260. These T5's are also compatible with the Aquatlantis range of T5 Lighting. With this lighting you are not restricted as much to the content of your aquarium, stock levels can be increased without the worry of inadequate levels of light. The greater intensity, deeper penetration and Higher output allows you to stock your tank with a wide range of soft corals and allow them to flourish which was not possible with T8 Fluorescents. 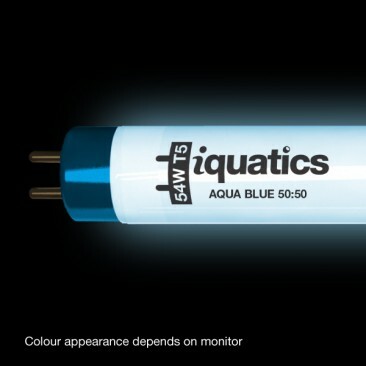 The iQuatics Aqua Blue 50:50 tube is our most popular fluorescent to date. It combines the phosphors of a Blue Plus tube with a 10000k full-spectrum daylight bulb. This bulb is great as a standalone bulb in smaller tanks or running alongside an iQuatics Blue Plus or the Actinic range in larger setups. 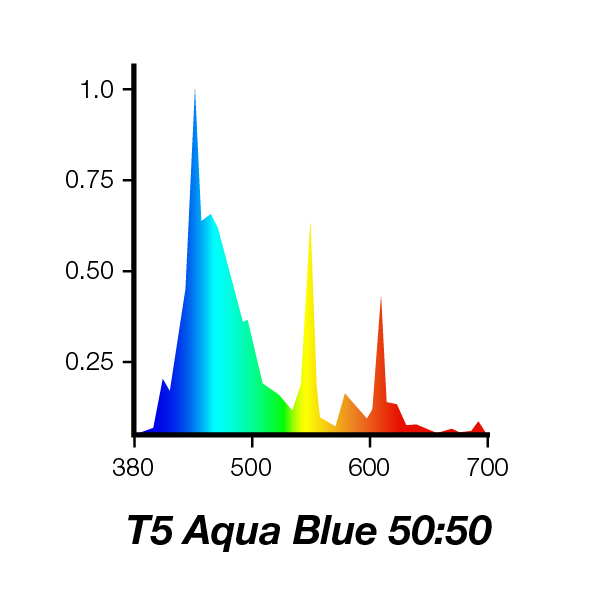 The Aqua Blue 50:50 has a mixed spectrum of useful light energy providing maximum PAR for ideal coral growth condition. With an overall blue tint to the visual output your tank will appear in its natural beauty with your corals located at both the higher and lower depths of your aquarium. It helps to balance out the washed out yellow hue in your aquarium. The iQuatics Aqua Blue works well as a supplement to metal halides or in combination with iQuatics Marine White 14000K. *International Delivery Available - We are unable to insure T5 Tubes internationally, a credit note will be issued in the unlikely event of items arriving damaged, this credit note does not cover the postal cost. *Juwel® is a registered trademark of Juwel Aquarium. 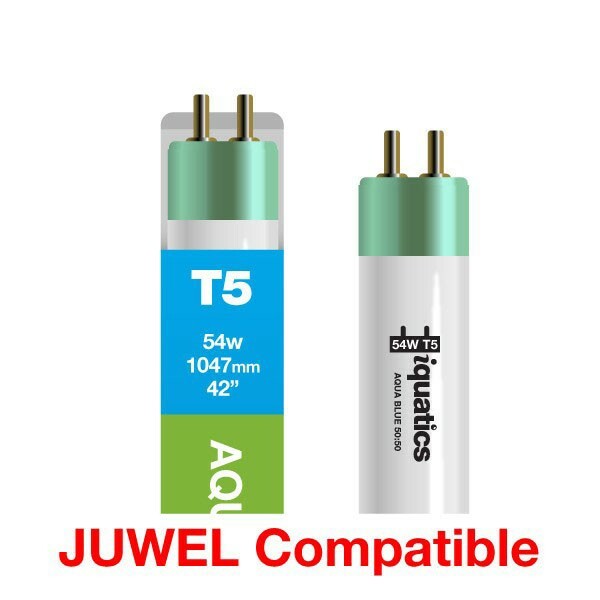 This product is manufactured by iQuatics® and is in no way associated with or manufactured by Juwel®. It is advertised as a product compatible with Juwel® products. Excellent service, reasonable prices. Thank you. 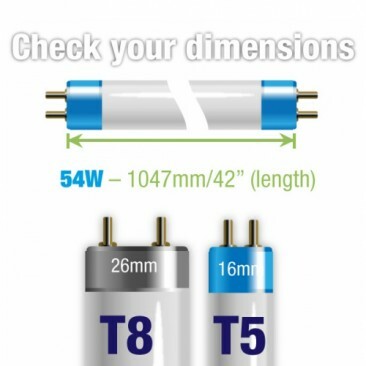 Tip: T8 Tubes are 8/8 inch in diameter (26mm). 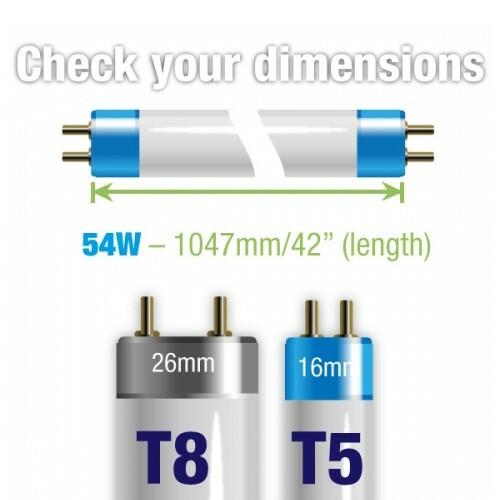 T5 Tubes are 5/8 inch in diameter (16mm). When measuring the length of your tube, measure in mm from end to end without the pins. Hi there. I'm looking for some new tubes for my juwel vision 260. I believe itâ€™s a t8 unit. What are my options? The options would be to change the lighting unit to a T5 pendant of Highlite t5 fitting; otherwise you would have to stick with the existing T8 setup which I’m afraid we don’t manufacture the tubes you require. Does your buy 2 get one free offer on bulbs only work with the same bulbs? eg if I buy 1 blue + and one 14k can I get another bulb free or do I have to buy 2 of the same bulbs for the third? You can mix and match the t5 tubes and still take advantage of the Buy 2 get 1 free offer. The cheapest tube will be the free one.